Here are some more very effective tricks which can be accomplished by any boy. First of all, blow out the contents of an egg, and then; when the interior of the shell is perfectly dry, pour fine sand into the empty shell until it is about a quarter full. Finally, cover the hole in the shell with white wax, so that no one will notice that it has been tampered with. It is always necessary, however, to first shake the egg, so that the sand inside will roll to the bottom. If however, it is desired to place the egg on end, as Columbus did, it is necessary to adopt a, slightly different method. 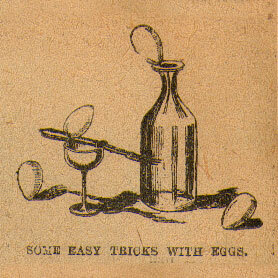 First the blown-out egg must be filled with tiny grains of meal and pieces of sealing wax. Then it must be placed on a warm stove, with the end downward. The result will be that the sealing wax will melt, and form a hard, solid mass with the meal, and when it cools, will completely fill the lower part of. The holes can then be covered with white wax, as explained above.